When Jill Paquette packed her bags for Alberta's Prairie Bible College at the age of 17, she couldn't have imagined she was leaving home for good. She thought she was about to embark on a life spent as an ethnomusicologist, her chosen field of study, but as is often the case, God had other plans. It happened on the way to basketball practice during her freshman year. An unplanned stop at a local coffeehouse led to Jill's impromptu debut when her friends, aware of her burgeoning talent, coaxed her to take the stage. She eventually acquiesced, but there was no way for her to know, as she plucked out an original tune on that borrowed guitar, that her life was about to dramatically change. As a result of that single appearance, Jill joined classmate Matt Brouwer's band, which began playing dates around Alberta, and a music career was born. But that was only the beginning. She also recorded a demo at the urging of a local producer, and that made its way to Nashville, garnering attention for the promising singer/songwriter. Meanwhile, back in Canada, the in-demand performer was squeezing in classes when she could between time on the road. While others had been aware of her talent for years, Jill may have been one of the few people who were surprised by the path her life was taking. After all, she didn't grow up dreaming of stardom. There was no practicing in front of the mirror with a hairbrush microphone or imagining crowds clamoring for her autograph. Instead, she passed her childhood years contentedly in Houston, a small mining and forestry town in British Columbia, Canada. With a population of just 3,000 and a remote location four hours from any major city, it seemed the ideal place to grow up. Days were spent exploring the seemingly endless forest with friends while summer brought the hum of four-wheelers and winter was synonymous with snowmobiles and skiing. Despite her laid-back nature and earthy upbringing, Jill was fiercely competitive when it came to music. Her brother, five years her senior, was a talented musician in his own right and Jill spent her growing up years determined to keep pace with his accomplishments. "That rivalry probably made me learn any music I know," Jill admits now, which is saying quite a lot-her repertoire consists of quite an impressive catalog considering she's been playing since she was three. It was at that young age that she began studying piano using the Suzuki method, learning by ear. As a result, instead of the latest from MTV blaring from her stereo during her teen years, Jill was cranking up the classics, playing mostly piano tapes, always eager to soak up something new. While her brother fueled her pursuit of music, it was Jill's parents who fueled her love of it. In the Paquette home, music was definitely a family affair. From the hours her mother cheerfully devoted to driving her children to piano lessons each week to the informal family concerts her father presided over in the evenings on his acoustic guitar, music was a way of life. Summers were highlighted by a week at piano camp, where Jill would mingle with the same kids she had been competing against all year at festivals. "Just to be around people who loved it as much as I did was great. You just wanted to play all the time," she recalls. 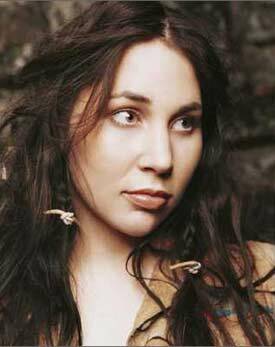 Her heritage as a French-Canadian with European and Native American roots has also impacted who Jill is and what she communicates through her songs. She grew up watching her aunts master the traditional artwork and leatherworking Native Americans were known for, and she was still a teenager when she received her aboriginal status card. Her Cree ancestry can even take some credit for getting her started as a performer. After all, it was Canada's Metis Foundation (metis literally means half-breed) that helped pay for her college education, ensuring she would be on campus for that first coffeehouse performance. Also shaping the music Jill makes was her transition from classical piano to acoustic guitar, an instrument she dubs "easily the coolest in the world." While her father and her brother were her original inspiration for giving it a try, she says, "When I started playing it, it just felt like home." Sharing her own thoughts and ideas from stage was something she also felt instantly at ease with. In a conversation, there's that fear that the words won't come out quite right, but songs are something entirely different. "I've had a while to think about the lyrics so I'm always glad people want to hear my heart that way," Jill says, "because I think I'm better at sharing it." Soon, everyone will be able to hear her heart as her Reunion Records self-titled debut, Jill Paquette, is released on July 22. Anyone who listens will have to agree that all those years of music study were put to good use on this thoughtful pop collection laced with folk influences. Produced by Steve Rendall and Eldon Winter up in Canada and Phil Madeira in Nashville, this buzzworthy disc addresses subjects that are personal to the songwriter but at the same time the themes are so universal the songs could be telling your story or mine. Tracks like "Come To Me" look at God's unchanging nature in the face of our questions, while "Not the Only One" is a heartfelt plea for honesty and support as we all pursue that unattainable goal of living a Christ-like life. While some songs are brand new, a tune like "Forget" dates back to that first coffeehouse performance six years ago. Together they tell a story of the joys and struggles of this 23-year-old musician, and at the same time, of you and me. And while it's true you can take the girl out of the small town, you can't take the small town out of the girl. Jill has relocated to Nashville and has a promising new career in front of her, but she hasn't changed much from the girl she was growing up. In fact, while she's excited at all that lies ahead, she still longs for the small town and the family that shaped the music she makes today. That bittersweet longing for home and all it represents is one she'll have to get used to, though. Once her music makes its way into the hearts of fans in her newly adopted home country, they aren't likely to let her leave anytime soon.